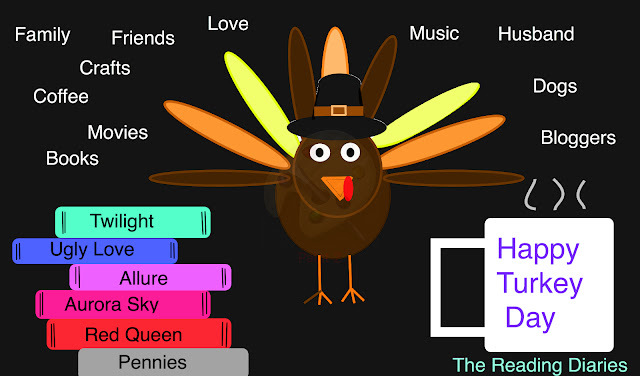 The Reading Diaries: Happy Thanksgiving!!!!! I hope everyone is having a happy safe Holiday!!! Today for us should be super nice and quiet. My friend's husband is out of town this week so we teamed up our two households to make dinner. My friend has 4 kids and with my two and husband, it should be a full house. Since we are teaming up we split the meal but we are each making a few of the same dishes. I'm making a sweet potato casserole with a pecan crumble while her's has marshmallows. I'm also making a turkey and she's making a ham. I'm making the elusive Pecan Pie cheesecake that I've been talking about trying for years. I'm Thankful for lots of things this year, my health, family, friends, my kids and my wonderful husband. I'm thankful to all the coffee growers who without them I would be missing out on my must-have drink. I'm thankful to all the authors for creating all the amazing books even more than I will ever be able to read. I'm Thankful to all my followers who read my rambles without all of you I would be talking to myself. It sounds like a lovely day for you. Have a wonderful Thanksgiving. Pecan pie cheesecake sounds pretty amazing, I hope it was a success! I try to make pecan pie at Christmastime here if it's not too hot (I don't enjoy baking during summer), but I'm the only one that eats it. How terrible, a whole pie to myself lol I might need to try making a cheesecake this year, you've inspired me!